After tying the knot, couple wants to relax and enjoy sometime together, away from others. It is also the time when the newly married couple gets to know each other better. Honeymoon destination must be special to celebrate the memorable occasion of being together Check below some top honeymoon destinations in India. Goa (Land of Sun, Sand and Sea), one of the most popular romantic destinations and one of the top honeymoon destinations in India. The setting sun, miles upon miles of golden sand, coconut palms playing with the wind. This is the charm of Goa. It is the perfect place for togetherness. 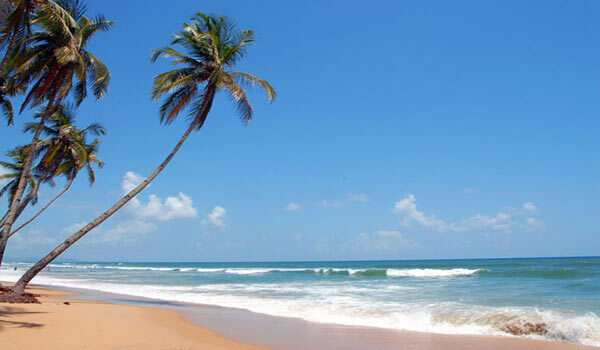 Multi-cuisine restaurant, clean and secluded beaches make Goa an ideal setting for romance and relaxation. The lush natural beaches, excellent infrastructure and facilities, warm and welcoming people - all add to the special magic of Goa. Located on the Nilgiri hills and surrounded by blue mist, Ooty is probably the most celebrated honeymoon spot and one the top 10 honeymoon destinations in India. It promises you a very romantic honeymoon. There are lots of attractions in the town and around it. Places you must visit include the Botanical Garden, Rose Garden, Ooty Lake, Dodabetta peak. Plethora of beautiful flowers on the hilly slopes, splendid tea and cardamom plantation and mist covered mountains indeed make Ooty a very romantic place. The abundant flowers, lushy vegetation and majestic hills add charm to this quaint hill-station. Ooty is perfect place for couples who like to be in the lap of nature. Shimla is one of the most popular and another top honeymoon destinations in India. The moment you enter, you’ll be greeted with salubrious climate, and picturesque green hills with snow peaks surrounded by thick forests of fir, pine and oak making it a favorite among honeymoon couples. It is one of the most famous hill stations and has been attracting Honeymooners for quite a long time now. Most attractive feature of Shimla is its salubrious climate that is very conducive to for a romantic holiday. Shimla has plenty to offer trekking enthusiasts as well as those looking for easy hikes and scenic drive. You can view some of the most beautiful mountainscapes and flower-filled meadows in Shimla. A drive around Shimla will take you to rustic villages, river gorge, temples and pastures. Exploring Shimla with your beloved will add zing to your romantic holiday. The lush valleys, sparkling lakes, high mountains and beautiful scenery make Srinagar a tempting place for honeymooners. Srinagar, the capital of Jammu and Kashmir, a very popular honeymoon destination. It is a perfect place to start you life in the wonderful company of your partner. Snow peaks stare at you from the horizon. Scenery is simply spell binding. Beautiful lakes, charming rivers, lofty glaciers, and pleasant weather throughout the year make it an ideal destination for newly weds. A holiday in this paradise, glittering in nature’s beauty will linger in the minds of the visitors for long. The house boats of the Dal Lake are the biggest attraction and "Shikara" rides in the lake are a symbol of romance worldwide. Coorg, also Known as Kodagu, is an excellent honeymoon destination in south India. Lush green, serene, scenic and devoid of city chaos Coorg is a virtual heaven for those seeking some private time in the lap of nature. Honeymooning in the intoxicating and invigorate beauty of Coorg would be a wise choice if a secluded getaway is what the couple is looking for. The orange orchards, the refreshing aroma of coffee and acres of verdant greenery is ideally suited for a cozy honeymoon. Sprawling in the midst of cloud-wreathed hills, this misty town is a haven for walkers. Coorg can be visited around the year owing to its pleasant weather. There are some hill resorts that cater to the special needs of honeymoon travelers. Some of the suggested places to visit would include the Madikeri fort, Harangi Dam, Bhagamandala, Irupu Falls, minarets of Dodoveearaja, Abbi falls and many of the famous temples. In the refreshing hilly air of Darjeeling, acres of tea plantation will offer you a majestical and cherishable honeymoon like no other destination. Lying in the eastern state of West Bengal the city offers the cool and chilly weather of Himalayas. Darjeeling promise young couples green picturesque hills and bubbling waterfalls and is the top honeymoon destinations of India. Walking in the sloppy tea estates and terraced farms could be one of the most memorable things after this Whether you prefer to relax, adventure or savor the flora and fauna of this region, Darjeeling is really a traveler delight. River rafting and canoeing are also widespread in Darjeeling apart from mountaineering and trekking. Rajasthan is one of the most historic destinations of India, it has so much history and huge palaces that make it a class apart from the rest. You can enjoy elephant back rides, camel rides, Rajput style water gardens, historical forts, moonlit boat ride and much more. Most popular honeymoon destinations in Rajasthan include cities like Jaipur, Pushkar, Udaipur, Jodhpur, Jaisalmer, Bikaner, Mount Abu, Barmer and Mandawa. Udaipur, the lake city, is the most romantic place to visit in Rajasthan. Mount Abu the only hill station in Rajasthan has everything that the newly wed would like to experience. The area is the coolest when compared to the neighboring states both Rajasthan and Gujrat. Bikaner is a romantic tourist destination in Rajasthan state. This historical city consists of religious shrines, beautiful forts and castles. Rajasthan is the land that breathes both romance and chivalry in an exceptionally traditional way. It has the most pictorial scenes that are worth viewing. Catch the lovely sunrise on the sand dunes with your partner at your side and experience the royal Rajputana heritage that can be cherished for a lifetime. Today Kerala, a state in south India is best known as ayurveda centre, backwaters destination and a honeymoon’s paradise. Kerala is also known as the “Gods Own Country” is one of the top ten honeymoon destinations of India. It is one of the most beautiful parts of india where the natural beauty will not only amaze you it will sweep you off your feet. It is a perfect destination for vacations Honeymoon, art, culture, tradition, health care, yoga, ayurveda and meditation. Kerala is famous for its natural beauty, amazing beaches, delicious sea food and backwaters. Backwaters - a unique web of lakes, lagoons, canals and rivers - are an integral part of Kerala's Tourism Scenario. You can also stay in the houseboats and enjoy your honeymoon in Kerala in a traditional style. All these ingredients make up Kerala a prefect romantic vacation spot. Kovalam is a beach town on the Arabian Sea in Kerala, a state in south India. It is located around 13 km from downtown Thiruvananthapuram (Trivandrum). With natural beauty at its best, planning your honeymoon in Kovalam is no brainer. Rows of swaying coconut trees are lined along the sandy beaches of Kovalam. With its expertise in ayurvedic techniques over centuries, town makes sure you pamper yourself and leave in the pink of health. Natural and romantic surrounding will surely make your moment with your loved one captivating and delightful. Lakshadweep is the smallest union territory of India, is a group of islands 200 to 300 km off of the coast of Keralam in the Laccadive Sea. The pristine coral paradise of Lakshadeep with a tinge of bluish-green waters is an exotic archipelago in the Arabian Sea. Lakshadweep Islands lives up to the expectation as the best honeymoon destinations in India. The most romantic place to stay at Lakshadweep would be the beach cottages. The beaches of this wonder world amidst the sound of the roaring waves, the rustling sound of the swaying palm tree, and the amazing marine life makes this island most preferred romantic gateway. The adventurous sports along with a wonderful combination of scenic splendor adds a special dimension to the island Lakshadweep. Soak your souls in the tranquil beauty of nature and make the most of the romantic ambience. Located in the state of Himachal Pradesh, Manali is an ancient town surrounded by snow capped peaks and close in proximity to the snowline. It has a flourishing orchard industry and is a popular destination for adventure sport enthusiasts, campers, trekkers as well as honeymooners. About 550 km from Delhi, the capital of India, Manali offers visitors some amazing natural sites like hot water springs , waterfalls and the river Beas that runs right through. Apart from those there are beautiful temples scattered across the place and the city center has a monastery as well as some good shopping and eateries to enjoy. . If you want to mix romance with a spice of adventure then this is the ideal destination for a couple who wants to spend time together. Hope the above list top 10 honeymoon destinations India, will be helpful. There are many other romantic destinations in India, choices always depends on what you like. Agra in Uttar Pradesh state is famous for one of the eight wonders of world the Taj Mahal. Anyone who is on a travel spree his trip would be incomplete without the visit to the most elegant Taj Mahal. This is one of the must see places list of India, the eternal symbol of love. Nanital promises a typical honeymoon in a romantic hill station. Pleasant weather, enchanting lakes, lovely scenery and cozy boat rides make it a preferred destination. The emerald islands can be another choice as a honeymoon spot. There are a lot of places in Andaman and Nicobar that you would like to visit. Three of the most romantic here are Mount Harriet, Viper Island, Ross Island. Contact your near travel agent and ask for details according to your budget and choices. You can also ask for further information about the locations mentioned above. Hmm, all these are excellent places for honeymoon which are mentioned in your post but Kerala, Goa, Ooty and Manali are my favorite places over there. IMO, Kerala is one of the most attractive destinations in India for honeymoon couples which are identified for its attractive beaches and extensive backwaters. I think a romantic place would have to be New Zealand, or maybe Spain. Nice place.. However i must say that there are top Honeymoon Destinations in India as well.